From the spring of 2016, the three bodies will be offered optionally with the exclusive Competition Package of BMW M GmbH, which not only includes more sports personality, but an improved vehicle dynamics. 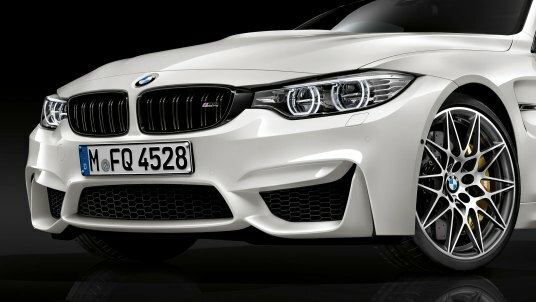 Besides optimum maneuverability, the Competition Package also includes unique features and an increase of 14 kW/19 hp to reach 331 kW/450 hp (BMW M3 Sedan/BMW M4 Coupe: combined fuel economy of 11.36-12.05 km/L and CO2 emissions of 194-204 g/km; BMW M4 Coupe: combined fuel economy of 10.99-11.49 km/L and CO2 emissions of 203-213 g/km). The package includes the Adaptive M Suspension, which has been set-up specifically for this release and includes new springs, shock absorbers and stabilizer bars with new programming of drive modes (Comfort, Sport and Sport+). Also, the Active M Differential in the rear axle and the Dynamic Stability Control (DSC), have been set under the new vehicle dynamics. 20 inch forged and machined M wheels and as well as optimized in weight and stiffness: front 9J x 20; rear 10J x 20- with the exclusive 666 M unique design of several arms and combined rims (front: 265/30 R20, rear: 285/30 R20) complete the improvements in the chassis. Some details that the attention on the outside of the Competition Package include, for example, Exhaust M system with black chrome tips. Even more than its stunning look, the main feature of Exhaust M System, is its powerful sound, which gives greater emotional resonance to the driving experience. The rumble in starting and purring when accelerating never fail to excite the drivers again and again.